The increasingly international nature of crime underscores the need for countries to work together to control crime and terrorism. For there to be effective and efficient cooperation on the international level, it is necessary for countries to understand the structure of other police systems. The World Police Encyclopedia fulfills this need by providing a systematic survey of the police systems of all the member nations in the United Nations and Taiwan. 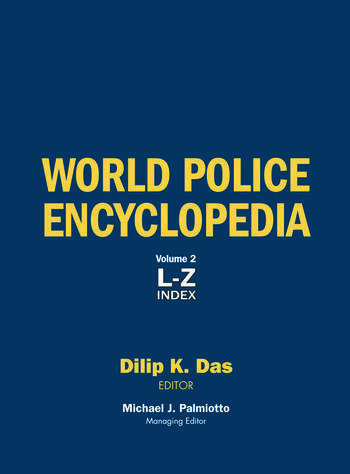 Written in a clear and accessible style, the World Police Encyclopedia is an essential resource that scholars, students, and those involved in working to control international and domestic crime will turn to for fact-checking and as a solid starting point for wider research and exploration. For a full list of entries, contributors, and more, visit www.routledge-ny.com/ref/WorldPolice. Dilip Das, who began his career as a police office in India, is professor in the department of socilogy and criminal justice at SUNY Plattsburgh and editor of the journal Police Practice and Research. Among other positions of leadership in the field of policing, he serves as an expert of the UN Human Rights Office in Geneva and has taught police human rights courses all over the world. He has published widely on the topic of policing, including Challenges of Policing Democracies: A World Perspective and Meeting the Challenges of Global Terrorism: Prevention, Control, and Recovery. Michael J. Palmiotto is professor of criminal justice at Wichita State University and has written and edited several books, including Police Misconduct: A Reader for the 21st Century, and Policing: Concepts, Strategies, and Current Issues in American Police Forces.